A team of researchers from the National University of Singapore (NUS) has developed a novel microchip named EQSCALE that can capture visual details from video frames with extremely low power consumption. The video feature extractor uses 20 times less power than existing best-in-class chips, so it only requires a tiny battery. It could reduce the size of smart vision systems down to the millimetre range. For example, it can be powered continuously by a millimetre-sized solar cell without the need for battery replacement. 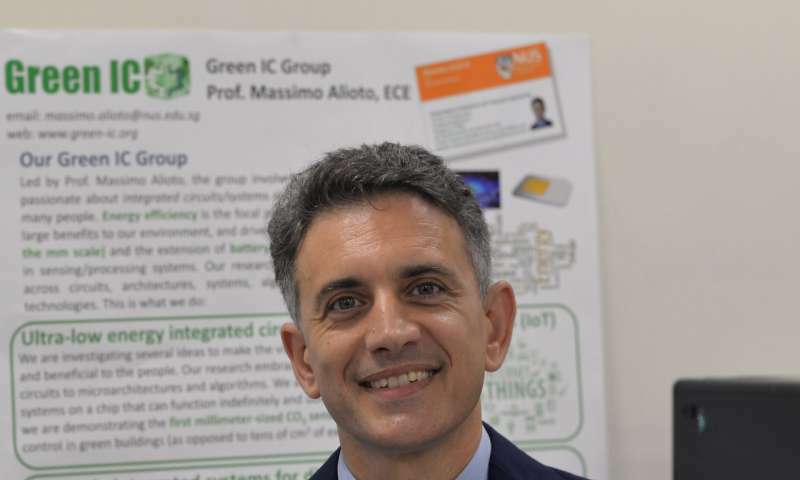 Led by Associate Professor Massimo Alioto from the NUS Faculty of Engineering, the team's discovery is a major step forward in developing millimetre-sized smart cameras with near-perpetual lifespan. It will also pave the way for cost-effective Internet of Things (IoT) applications, such as ubiquitous safety surveillance in airports and key infrastructure, building energy management, workplace safety, and elderly care. "IoT is a fast-growing technology wave that uses massively distributed sensors to make our environment smarter and human-centric. Vision electronic systems with long lifetime are currently not feasible for IoT applications due to their high power consumption and large size. Our team has addressed these challenges through our tiny EQSCALE chip and we have shown that ubiquitous and always-on smart cameras are viable. We hope that this new capability will accelerate the ambitious endeavour of embedding the sense of sight in the IoT," said Professor Alioto. The NUS Engineering team's microchip, EQSCALE, can perform continuous feature extraction at 0.2 milliwatts—20 times lower in power consumption than any existing technology. This translates into a major advancement in the level of miniaturisation for smart vision systems. The novel feature extractor is smaller than a millimetre on each side, and can be powered continuously by a solar cell that is only a few millimetres in size. Professor Alioto explained, "This technological breakthrough is achieved through the concept of energy-quality scaling, where the trade-off between energy consumption and quality in the extraction of features is adjusted. This mimics the dynamic change in the level of attention with which humans observe the visual scene, processing it with different levels of detail and quality depending on the task at hand. Energy-quality scaling allows correct object recognition even when a substantial number of points of interests are missed due to the degraded quality of the target."